We provide a variety of software to improve business performance from simplifying backup, identifying and analysing data to moving information to the cloud. Software is playing a more relevant role in business from just being an operating system or application to managing pools of storage and increasing performance to assisting in the management in a hyper-converged infrastructure. Increasingly operating systems are now allowing the direct integration of storage for management and the OS is automatically aware of the type of storage connected to the network so that it can provision and host the disk storage. Some software we provide migrates all of your on-premise mail to Office 365 including PST’s we validate the integrity of the messages or the existence and number and stubs. The solution also meets SEC Rules 17a-3 and 17a-4 Guidelines, including ensuring WORM Compliant Storage. 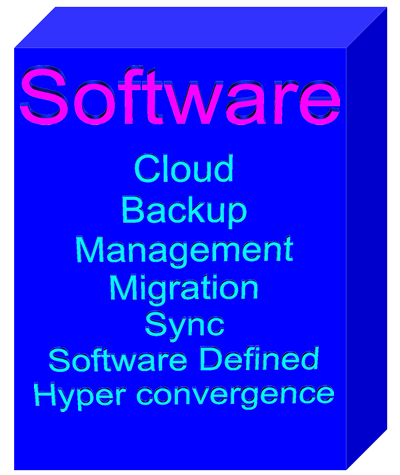 Another software product we provide allows the remote replication of one-2-many or many-2-one files, this could be daily store pricing or a computer system backup. Rather than using the traditional approach of Server-Client we use Peer-2-Peer. Sync large media files across a room or across the globe with complete security avoiding 3rd party servers or cloud, allows you to Sync files from a Server, Desktop, Notebook, Mobile Phone. Sync all your data, across all your devices and download files and documents when you need it. Also, it is up to 16x faster than sending data to the cloud. A distributed architecture leverages the combined power of all endpoints to deliver a solution that is faster and more reliable than anything else in the market. Utilising local copies on the LAN instead of pulling them repeatedly from a distant and overloaded central server, it avoids placing undue strain on weak links in the network, such as those connecting many remote offices or retail locations. If you would like to know more about the various types of software we provide then call us on 01256 331614 or complete our form below.